Tsubaki of Canada – Kabelschlepp Division can now supply cables and hose carriers populated with Continuous High Flex Cables and Wires! Local stock of PVC/PUR jacketed cables and wires are available for quick lead times! Kabelschlepp recommends using a continuous high flex cable in all of its cable carrier systems to extend the life of both cables and cable carrier systems. Therefore, a cable specifically designed for this continually-flexing tight bending radius type application is the best choice for use in our cable carriers. By ordering the cable carries and cables from Tsubaki – Kabelschlepp you only have to deal with ONE supplier, ONE lead time and ONE warranty! Provide us with your cable and wire specifications today and we will quote you with an appropriate cable recommended for our carrier systems. Kabelschlepp’s Conduflex fully enclosed carrier system provides a well sealed design for extra protection from environments where you need a “liquid tight” cable & hose carrier system. The Conduflex carrier is used in environments like machine tool, welding or wash down to protect cables & hoses from the outside elements such as coolants, weld spatter or cleaning solutions. 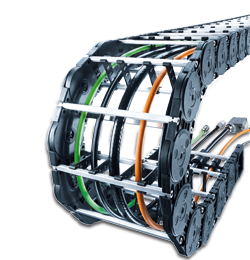 Kabelschlepp’s modular design makes it easy to shorten or lengthen the carrier system at a later date. It also allows you to repair/replace sections “in the field” without having to purchase a whole new carrier system if damage occurs. The Conduflex product saves you money by protecting cables and hoses in a harsh environment thereby eliminating the associated downtimes experienced when using a standard open style cable & hose carrier where metal chips and coolants often cause failures to the cables & hoses. 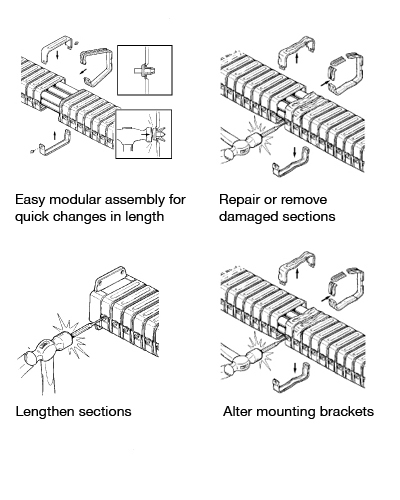 Many inside cavity sizes and bend radii are available, along with 4 different types of mounting brackets can be selected to give you the best mounting options available to adapt to your machine design. 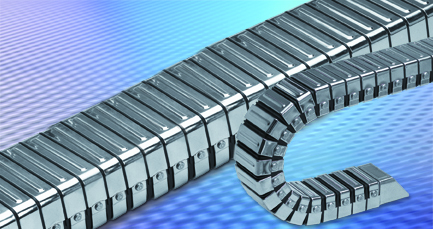 When there are hot chips or other debris present that could possibly damage the polymide(nylon) hinges, many of the Conduflex series carriers can be fitted with protective guards to provide extra protection in these environments.